Here you will find a summary of some of the most frequently asked questions we receive regarding alkaline water, ionizers, filters, etc. If you are unable to find the answer you are looking for, please feel free to submit your questions and our water experts will respond within 1-2 business days. For a more immediate answer you can give us a call at 1-888-624-2169. Is the alkaline water that I buy in the store the same as your water? No, our water has ORP, which is an electric charge that creates oxidation reduction potential which acts like an antioxidant. This charge can only be sustained for 12 to 24 hours and cannot be bottled. What is ORP (Oxygen Reduction Potential)? ORP is the electrical charge needed to reduce or slow down oxidization (decay). Alkaline water must have a negative ORP in order to be considered beneficial to drink. ORP provides the ability to reduce oxygen’s ability to oxidize. ORP can be measured through an electronic hardware device. A negative ORP value (meaning a surplus of electrons) in ionized alkaline water is evidence of its antioxidant power. 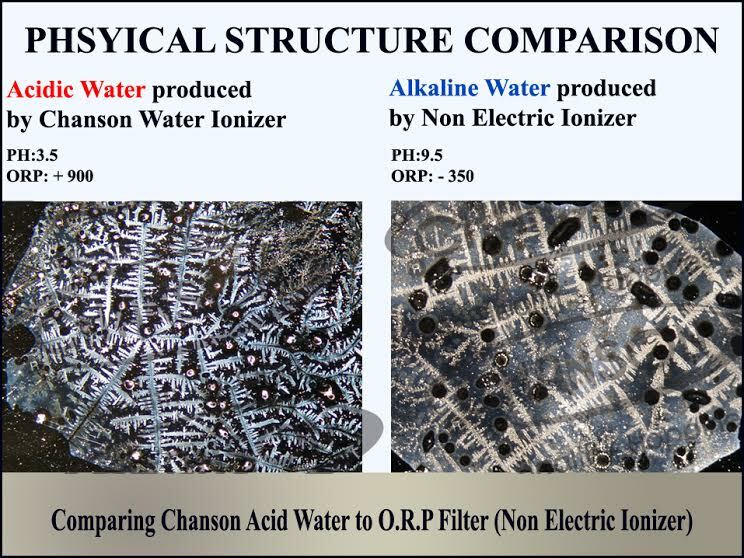 Are the pH and ORP produced by a Chanson Water® Ionizer always the same? Values and quality of alkaline water will vary from region to region due to differences in source water. In cases where local water has excess minerals the taste may be affected, or the alkaline water produced may have too high of a pH level. Since water pressure from the faucet affects the production of alkaline water, it is important to confirm that genuine alkaline water is being produced by regularly checking that it is set to the correct pH level and checking for small bubbles. Can I use a water ionizer if my source water is from a well? The efficiency of electrolysis can drop when well water is used since it tends to hold a lot of free carbon dioxide and only a small amount of electrolytic minerals. If you are using well water, we recommend that you contact us at (949) 600-7970 with a copy of your well water report so we can make recommendations as to specific pre-filters that will greatly improve the taste and performance of your ionized alkaline water. Can I use a Chanson Alkaline Water Ionizer with a Reverse Osmosis (RO) System? The process of osmosis literally strips the water of ALL minerals, which are the primary key to electrolysis. The solution is to add a remineralization cartridge between your RO system and your Chanson Water® Ionizer. Can I make my baby’s formula with alkaline ionized water? In the case of infants under one year old, the intestinal movement is generally different from adults since breast milk or milk is the only thing they consume. Therefore, the use of alkaline ionized water is not encouraged until the infant begins to consume more sophisticated foods. In any case, alkaline water should not be used to make formula for infants. Use the purified water (pH 7) setting instead. Can you become too alkaline? It is a good question. We challenge you to become too alkaline! Even if you were to drink nothing but pH water at a pH level of 11 for months, you would not become too alkaline, unless you are also on a strict diet of RAW greens and vegetables and you never get stressed or angry. The federal guidelines for tap water is that tap water be alkaline! That is right; tap water must be over 7 pH. It is very easy to see how pH your internal body is, just go to your local drug or health food store and buy some urine pH test strips and test your first urine of the morning. If you are under 7 you are acid no matter how much water you drink, and if you are over 7 you are alkaline. If you are at an 8 then you would be TOO pH. But we have never seen or heard of anyone hitting a pH of 8. There is a disease called “alkalosis” where the body is over alkaline and less than 2% of the population is susceptible to this disease. If you do not eat well, do not drink ionized water, and do not exercise, yet your urine pH is an 8 then you fall in that 2%. Keep in mind, 80% of the benefits of ionized water is not the pH, it is the ORP or antioxidant power. Hundreds of thousands of users have been drinking nothing but ionized alkaline water for many years, including Chanson co-founders Ronnie Ruiz and Nedalee Thomas (over eight years), and Chanson Taiwan president Mr. Liao for more than 30 years. Soda, beer, coffee and juice (as well as almost all of the foods we eat) can have PH levels of 5 or lower. Alarmingly, one cup of coffee needs 20 glasses of ionized water to neutralize the acid consumed. Getting frustrated or angry also floods the body with acids, therefore it is not easy to take such an acidic environment and become over alkaline. You asked for studies, but who will pay for this study? Certainly no drug company will. Alternative products rarely have studies to back them up, but in our case we have hundreds of studies specifically on ionized water and many of them can be seen in our “articles” section. Ionized water has some critics out there but none are calling it dangerous, they only question its potentials. One thing we do have is 30 years of clinical use in both Japan and Korea including hundreds of hospitals who administer the water, with zero lawsuits filed or claims of sickness or damage in any way. The same is true in the USA, although Americans have not been enjoying Chanson ionized water for as long. One thing we can say for sure is that Chanson ionized water is safe and three decades in Japan and Korea have proved that, while Russians have safely been consuming ionized water for eight decades. We personally have a few thousand customers (most of which drink only the ionized water), and we have yet to receive any complaint regarding health for any reason. Drink with Confidence! What is the “Cluster Theory” of Deoxidized Water? Approximately 15 years ago, with the help of the nuclear magnetic resonance (NMR) appliance, a theory that water does not exist in single unit molecules was confirmed. Water molecules form molecular clusters of approximately 13 water molecules. These clusters constantly repeat an aggregation/disaggregation process. The quality of water and its ability to hydrate, directly depends on the size of its clusters. For example, small clusters have active molecules that increase the capacity of water to dissolve elements (solubility), let elements pass through (permeability), and let heat and electric charge pass through (conduction). Electrolysis gives the water molecules similar charge, which causes them to repel each other and break apart. Ionized alkaline water has clusters made up of five to six water molecules resulting in a lower molecular weight, better solubility, permeability, and conduction. Standard tap water contains about 12-15 water molecules per cluster. Chanson ionized alkaline water is microclustered, alkaline, ionized, structured, electrolyzed and reduced. Click here to see our microcluster report. To ionize means to gain or lose an electron. Direct current flows from (-) pole to (+) pole. Electron current (e-) is opposite to current (I), so the movement of electrons flows from (+) pole to (-) pole. Should I use acidic water or strong alkaline water to wash fruit and veggies? If you were to use acid water to clean fruit and veggies for a fear of bacteria then just do a dip in the acid not a soak, as you do not want them to absorb the acid and then consume it. After the dip you can go to alkaline for a soak. We recommend soaking in standard 8.5 pH water, as a stronger level will infuse the vegetable with too much ORP. We used to use a 10.5 until we discovered it was making the fruits have up to a -700 ORP and that in nature these fruits or veggies will never be below -100. So 8.5 pH water will still wash and clean them but infuse a much lower and more natural ORP. How can ionized water provide both excess oxygen and antioxidants if oxygen is oxidizing? While traditional water contains free oxygen (O2) which is actually a free radical that oxidizes the body, ionized water binds oxygen to hydrogen resulting in a safer delivery of oxygen to the cells. Ionized water also has negative ORP (Oxygen Reduction Potential) which means it is full of antioxidants that seek out free radicals. Won’t my stomach acid render alkaline water consumption useless? No. There is no hydrochloric acid pouch in our body, and the stomach wall makes sodium bicarbonate to alkalize our food not digest our food. HCL is only produced when we eat or drink acid-forming foods and drinks and is balanced in equal proportion by sodium bicarbonate production. When we consume alkaline forming foods and drink alkaline ionized water, the body does not need the sodium bicarbonate production and thus the HCL production is not required either! Can’t I make my own alkaline water with lemon juice, baking soda or pH drops? Yes, technically the pH level of water can be modified slightly by adding certain substances, however they will not necessarily reach the optimal pH level of 9.5. More importantly, alkalizing the water without the use of a water ionizer will not reduce the ORP, so the water will still be oxidizing to the body and create free radicals which destroy cells. Ionization is also the only way to microcluster the water, which allows it to hydrate up to six times better than non-ionized water, and detoxify cells more thoroughly. Is alkaline water a scam? You will find may so-called “Alkaline Water Scam” pay-per-click ads on the Internet. These alkaline water scam ads and pages are just fake hooks used by certain disreputable water ionizer companies to build on negative curiosity and trick you into going to their site so they can sell you a water ionizer. Alkaline water is not a scam and water ionizers are not scams. As a matter of fact, while most people in the United States haven’t heard of alkaline water or water ionizers, they have been around for a very long time and have a very reputable history of helping people and having many benefits. Electrical energy pioneer Michael Faraday invented electrolysis in the 1800s. His device separated water into hydrogen and oxygen. Later Russia worked to improve the utilization of the technology and by 1966 the Japanese Health and Rehabilitation Ministry confirmed that alkaline ionized water was beneficial for health improvement and medical use. Today over 30 million people in Asia use water ionizers to assist in their good health. The use of ionized alkaline water to support and benefit good health is now becoming widely available to people in North America and Europe. Chanson has been selling and servicing water ionizers for over twenty years in Asia and as of 2011 has been manufacturing them for over 13 years. Chanson Water® USA has been able to expand the water ionizer revolution into seven English and Spanish speaking countries and continue to expand and help other international distributors join the water ionizer revolution every year. Many medical studies have been done on the use and benefits of water ionizers and alkaline ionized water and clearly prove that alkaline ionized water is nothing close to a scam. We have many of the studies available here on our site for your review. We invite you to read them and then try one of our ionizers for yourself and see why we like to say that Chanson Water® is the possibility of a miracle. If I live in a place where the tap water already has an alkaline pH, do I still need a water ionizer? YES! All tap water is federally regulated to be at least a neutral (7 pH). Our local tap water is in the 9 pH range on most days. However, we never started having any health benefits from our tap water because it lacked ionization. Even when water has an abundance of alkaline minerals, it does not mean that your body can absorb them all. Water ionizers restructure the water, reducing surface tension and making the alkaline minerals in the water bioavailable (more easily absorbed by the body). Isn’t reverse osmosis the best water filtration process? While reverse osmosis rids tap water of virtually all nasty toxins, contaminants and bacteria, making it as pure and crystal clear as can be, the problem with reverse osmosis (R/O) is that it works TOO well. In addition to removing all of the impurities, it also strips the water of all the valuable alkaline minerals your body needs to thrive. Essentially, R/O water is dead, lifeless, and never found in nature, and most bottled waters on the market today are made with R/O water. Due to the removal of alkaline minerals, R/O water has an acidic pH level instead of a neutral or alkaline pH which municipal tap water sources mandate. It also has a positive oxidation reduction potential (or +ORP) value, which means it is oxidizing to the body and creates cell-damaging free radicals. On the contrary, alkaline ionized water from a Chanson water ionizer takes the minerals that are present in your water and makes them more bioavailable, has an alkaline pH and an energizing, free-radical fighting -ORP. Chanson ionizers duplicate what happens in nature when water runs over rocks through electrolysis, separating alkaline and acidic ions in the water, leaving healthy, mineral-rich drinking water closer to what nature intended. However, because the onboard filter(s) that all brands of water ionizers come with provide a level of filtration far inferior to R/O systems, we strongly recommend pairing a drinking water pre-filter with your water ionizer. Is alkaline water safe for pets? Yes. Alkaline drinking water can benefit pets in many of the same ways it can benefit humans. Because reverse osmosis and chlorinated tap water are not found in nature, a dog will always choose a muddy puddle (full of alkaline minerals) over those unnaturally altered waters. We recommend never advancing over the level one alkaline setting for small pets, as their tiny systems don’t need the extra alkalinity of the higher levels. 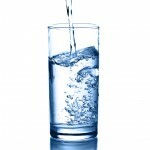 Is alkaline water safe for the elderly? The older a person is, the more toxic they are likely to be after decades of accumulating toxins in their food, water, and environment, especially if they are on a lot of prescription drugs. Because of this, the elderly are more likely to experience detox systems when they first start drinking alkaline water and may need to continue drinking level 1 alkaline water for a longer period of time than the average person before moving up a level. Prescription drugs should always be taken with the filtered water setting on your ionizer, as alkaline water can speed up the delivery of time release tablets. What about non-electric ionizers? Don’t they work just as good as electric? onization is obtained through the process of electrolysis, which requires an electric charge. That electric charge is similar to a “spark of life” and is what causes you to crave ionized water and will help you drink more of it. While non-electric “ionizers” can make changes to pH and ORP, you will not get the same health benefits from a non-electric as you will an electric. In fact, when magnified hundreds of times and studied under a microscope, non-electric water closely resembled acidic water, which is not recommended for drinking. Below is an illustration. I saw ABC ionizer won an award on XYZ ionizer review website. Have your ionizers won any awards? Some of our competitors have chosen to engage in a very deceptive marketing tactic in which they create fake ionizer review sites and give themselves awards to encourage you to buy their products. They may look unbiased at first glance but will always steer you towards their brand in the end. We at Chanson do not engage in this behavior, therefore we don’t have any fake awards to boast about. There are no legitimate companies that offer awards for ionizers at this time. Where will my Chanson Water® Ionizer ship from? Chanson Water ionizers shipping to the US are sent from Laguna Hills, CA by UPS. We do not ship ionizers using USPS, but we can ship all other products using USPS. Orders placed on a Friday after shipping time will not be shipped until Monday. All water ionizers shipped in the USA require adult signature confirmation upon delivery. Chanson Water® USA, Inc. is NOT responsible for lost or stolen packages. If the post office delivery confirmation shows that your package was delivered, please contact your local post or delivery service. An option to purchase delivery insurance is offered if this is a concern. Chanson Water® USA, Inc. cannot be held responsible for any delay in the delivery of packages, or for delay by customs inspection of international orders. Will the C3 Advanced Pre-Filter work for people who have the ionizer hooked directly to the faucet? the ionizer, plug it into the “in” side of the C3 Advanced Pre-Filtration then connect the ionizer to the “out” end of the filter. Where can I find a certified plumber in my area to install the under-counter water ionizer? Use our locator tool to quickly find handyman or plumber close to you. How much should an installation cost? If you have someone come out, drill the hole, and install it for you, installation should run between $100 and $150. Yes. The following adaptor will allow you to connect your diverter to most of the pullout/spray type faucets; not all, but most will work with this. It can be purchased at your local ACE hardware store or online by clicking here. Is there another way to connect the ionizer? We recommend a direct connection to the cold water line as a more functional arrangement where possible. If you have a spray faucet, you can run the line down that same hole and connect it underneath. Or consider the G2 acid faucet. What is the maximum water pressure my house can have when using a Chanson Water® Ionizer? Warranty does not cover damage from excessive water pressure. Pressure should not exceed 60 psi. If you are unsure, please have your water pressure checked before installing an ionizer. Call your local plumber for inspection, or for $10 you can purchase a water pressure gauge from your local Home Depot and test it yourself. The water pressure gauge simply screws on any outside hose and will reveal your water pressure when the water is turned on. What should be done if my water pressure is too high? Have a plumber adjust the pressure if possible, or have plumber install a new pressure regulator. This should be done whether you have an ionizer or not. How do I install the replacement filter? Please read the instructions for the installation of the replacement prefilters. 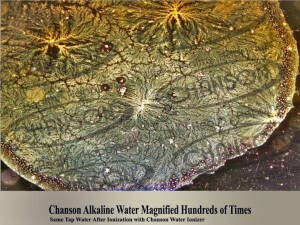 Should I ever clean my Chanson Water® Ionizer? Yes, please read the following information cleaning and maintenance of the Chanson Water® Ionizer. Does the Miracle M.A.X. still need a pre-filter? Yes, like all Chanson ionizers, the M.A.X. uses the PJ-6000 filter and we recommend prefiltration for all customers. Ionization causes the water molecule to be smaller, potentially concentrating any contaminates. Prefiltration removes a greater percentage of chlorine, chloramines, fluoride, arsenic, heavy metals, bacteria, pharmaceuticals and other contaminates than any onboard filter can by itself. Buy one to protect your health and always encourage others to do so. Do we need ionizer armor with the Miracle M.A.X. advanced cleaning system? Yes. Ionizer armor will help protect your drinking glasses from the white build up of calcium. How do I unlock a Chanson Water® ionizer? If you have a countertop model and the ionizer is in lock mode, no buttons will function including the cleaning button. To unlock the ionizer press and hold the lock button until you hear a beep and the voice will say pH unlocked. Now all buttons will work. To re-lock the ionizer onto a certain setting just press and hold the lock button on the setting you want with water running until the voice says pH locked. You will also see the word ‘lock’ in the upper right hand corner. If the ionizer is in lock mode for the VS-70, different buttons and selections will still work but you cannot change pH level. To unlock the VS-70, press menu button and if you do not see the word ‘lock’ on the screen then press the plus button until you see ‘lock,’ then press ‘ok’ and you should hear a voice say ‘pH unlocked’. To lock the VS-70 onto a certain pH level, first turn the ionizer on to the level you want it locked to, then press the ‘menu’ button, then press the ‘plus’ button until you see the ‘lock’ option and press ‘OK’. Do not forget to read our troubleshooting section for more questions and answers about our products. Press the “Confirm” button to the right of the screen until the main menu appears. When the menu appears, use the +/- buttons to scroll to the “Filter” option. Once “Filter” is selected, press the “Confirm” button to reset your filer counter. Press the power button once to awaken the unit. Press “Menu”, then use the +/- buttons to selected the “Filter” option. Once “Reset” is selected press “ok” to select and then “ok” again to confirm. Press and hold the “Mode” button until the screen in sowing the water level options. Press “Enter” four times to enter the “filter flow restoration” window. The current remaining “filter flow” will be shown on the screen. Press the + and – buttons simultaneously and hold for three seconds to reset the filter life (9000 liters by default) then press “Enter” to confirm. Press and hold the “Mode” button for five seconds to save and exit your settings. Why don’t you offer mesh technology on your ionizer plates? The idea of mesh plates being better or worse than solid plates is mostly marketing hype. We have found little difference in performance between mesh vs. solid plates. Despite many tests we have not seen a benefit from mesh or slotted plates, and we have found that in some cases, the coating actually wears off faster or has problems with rust. Therefore we continue to offer only original, double-dipped and baked solid plates on all of our ionizers. Why don’t you offer UV technology? We consider the UV technology in a water ionizer to be a marketing ploy that provides little if any actual benefit to the customer. While UV is used in commercial water treatment, we do not believe that the contact time between the water and the UV light in an ionizer is sufficient to kill bacteria. And even if it does kill any, it doesn’t remove it so you are still drinking dead bacteria. Furthermore, we have been told that once the light burns out, it can not be replaced. Currently in the USA, all city water has been treated with chlorine or chloramines which will have already killed any bacteria in your water. If you have well water or bacteria concerns, we offer the Chanson Ultra Filterwhich will remove bacteria and not clog. Can running hot water through my Chanson Water® ionizer damage it? No. While all Chanson ionizers are equipped with a hot water sensor to prevent damage to the filter, our plates and membranes are built with such high quality that hot water cannot damage them. In fact, we run scalding hot water through them as part of our cleaning and maintenance process and have been for over four years now. Other ionizer companies may warn against hot water usage due to the inferior quality of their plate cells, but with Chanson you can rest assured that no harm will come to your ionizer if you accidentally run hot water through it. The only thing that may be compromised is the filter which is much cheaper and easier to replace. 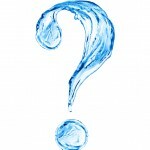 If you still have more questions on alkaline ionized water, submit your question here.